Chung Pu was found in 1981 and is a comprehensive company in aspects of design, manufacture, production, and processing. specifically for enterprises, companies, and individual users to provide high-quality auxiliary equipment and automatized services. The company products are not only sold in domestic market, but also sales to overseas markets. Quality has earned very much international recognition. and servo control system can be easily coupled with any lathes to control accuracy of machine. the replacement of material is no need to adjust the clamping system. one piece steel frame to form a more solid body. 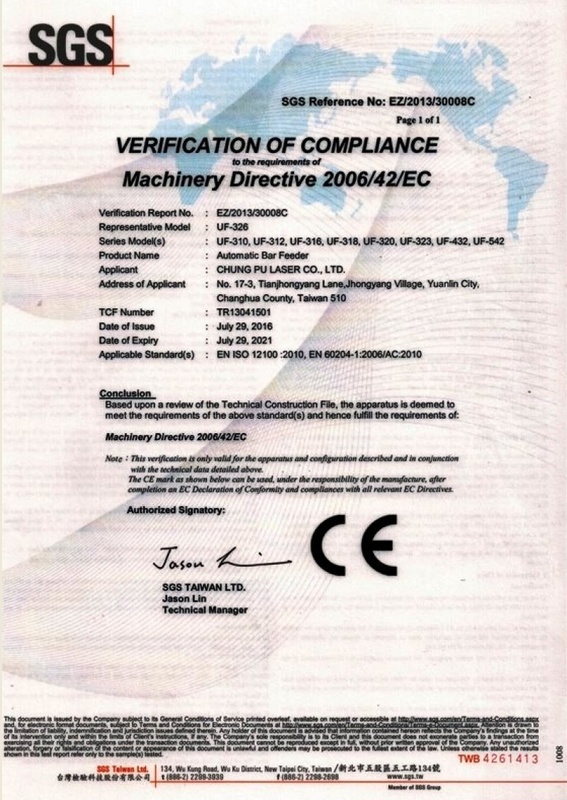 CE certification, and EN ISO12100: 2010 international quality certification successively to provide customers high quality products and safe user experiences. Our company bases on "high-quality technology and caring services" for business goals, and follows "reliable and honest"
corporate culture and perfect product manufacturing and design. innovation breakthroughs, and pursuit of excellence to win customers a wider trust and support!